Kishtwar Campus. 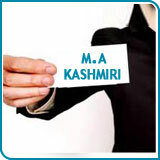 University of Jammu is starting M.A Kashmiri for the current session 2011-12 at Kishtwar. A candidate must have passed the Bachelor's degree examination or 10+2+3 pattern (Honours or General) in any stream from a statutoI') University /institution with atleast 40% of the aggregate marks (36% for Scheduled Caste/Tribe candidates). In addition to this a candidate must have studied Persian. Urdu. English Literature. Ilindi. Dogri. Arabic or Pun.iabi as one or the opt ional/elect ive sub.iect provided that the cand idate has passed matriculation with a language having Persian (Urdu) script. 1) Coordinator Campuses. Room No 214. Second 1-1001'. Administration Block. University of Jammu. 2) Kishtwar Campus. University of Jammu. 3)Bhaderwah Campus. University of Jammu.